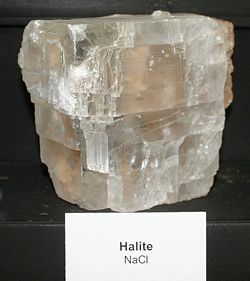 Halite is the mineral form of sodium chloride, NaCl, commonly known as rock salt. 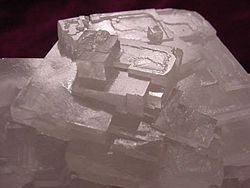 Halite occurs as cubic crystals that are typically colorless to white, but may also be light blue, dark blue, or pink. It commonly occurs with other evaporite deposit minerals such as several of the sulfates, halides, and borates. Halite occurs in vast beds of sedimentary evaporite minerals that result from the drying up of enclosed lakes, playas, and seas. Salt beds may be up to 350 meters (1150 feet) thick and underlie broad areas. In the United States and Canada extensive underground beds extend from the Appalachian basin of western New York through parts of Ontario and under much of the Michigan basin. Other deposits in the region are in Ohio, Kansas, New Mexico, Nova Scotia, and Saskatchewan. Salt domes are vertical diapirs or pipe-like masses of salt that have been essentially "squeezed up" from underlying salt beds by mobilization due to the weight of overlying rock. Salt domes typically comprise anhydrite (anhydrous calcium sulfate, CaSO4), gypsum (CaSO4·2H2O), and native sulfur, in addition to halite and sylvite (potassium chloride (KCl)). They are common along the Gulf coasts of Texas and Louisiana and are often associated with petroleum deposits. Germany, Spain, the Netherlands, Romania, and Iran also have salt domes. Salt glaciers exist in arid Iran, where the salt has broken through the surface at high elevation and flows downhill. In all these cases, halite is said to be behaving in the manner of a rheid. 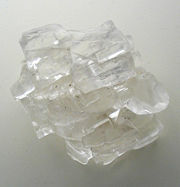 Large natural crystal of Halite, showing cubic cleavage breaks. Unusual, purple, fibrous veins running through halite crystals are found in France and a few other localities. Halite crystals termed hopper crystals appear to be "skeletons" of the typical cubes, with the edges present and stairstep depressions on, or rather in, each crystal face. In a rapidly crystallizing environment the edges of the cubes simply grow faster than the centers. Halite crystals form very quickly in some rapidly evaporating lakes resulting in modern artefacts with a coating or encrustation of halite crystals. Halite flowers are rare stalactites of curling fibers of halite that are found in certain arid caves of Australia's Nullarbor Plain. Halite stalactites and encrustations are also reported in the Quincy native copper mine of Hancock, Michigan. Mineral Gallery. The Mineral Halite. Amethyst Galleries, 2006. Retrieved September 10, 2007. Spiroff, Kiril. An Unusual Occurrence of Halite. American Mineralogist. 22:931-33, 1937. Retrieved September 10, 2007. The Mineral and Gemstone Kingdom: Halite Minerals.net. This page was last modified on 25 July 2017, at 21:19.